As long as you follow electrical specifications for Tibbits you can use and interconnect them in any way you like. This manual teaches a structured approach based on Tibbit sockets and tiles. This is the approach used by the Tibbo Project System. We will use the term Tibbit socket (or simply socket) to denote a landing space for a Tibbit. "Socket" here does not mean a physical socket into which a Tibbit can be plugged. Rather, it describes a space on the board that can accommodate a Tibbit device. This is not to say that actual physical sockets aren't there. In fact, Tibbits are installed on physical sockets most of the time. Our TPP2 and TPP3 boards offer a pair of physical sockets for each Tibbit socket. More strictly, we will use the term Tibbit socket to describe landing spaces for single-width C1 or M1 devices. Of course, Tibbits sockets for M1 and C1 are different. The following diagram depicts a fragment of the TPP3 board. The diagram shows a single tile with Tibbit sockets (S5), (S6), (S7), and (S8). Tibbit socket for "M" Tibbits occupies 7 x 14 board "squares" (one "square" is 2.54 x 2.54 mm) and has two 6-pin physical sockets. M2 devices require two Tibbit sockets next to each other. On the picture above (S5) and (S7) are "M" sockets. Note how there is an arrow with the M2 mark. 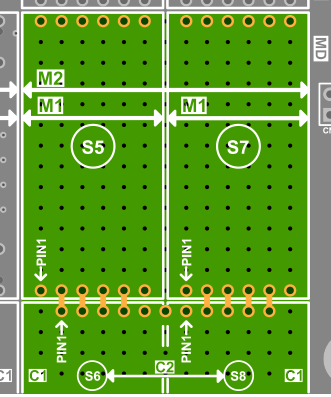 This arrow indicates that an M2 device will occupy both S5 and S7 spaces. Tibbit socket for "C" Tibbits occupies 7 x 4.5 board "squares". C2 devices take two Tibbit sockets. On the picture above (S6) and (S8) are "C" sockets. Notice how this socket pair shares a single 11-pin physical socket. This is because C2 devices have 11 pins. A pair of "M" sockets and a pair of "C" sockets together form a tile, as shown on the picture above. 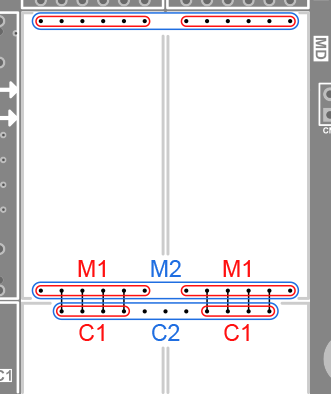 The diagram above on the right illustrates how the pins of M1, M2, C1, and C2 modules plug into the tile sockets.